Share your vocal or instrumental gifts by participating in choir or special music. Help tend the gardens and care for God’s creation. Contribute to worship by reading the lessons, baking communion bread or anything in between. You don’t need to be a pastor to share God’s message. Learn more about how you can help lead Adult and Children’s Ministries. Enjoy working behind the scenes? Join a task force! From planning worship services to outreach and fellowship events, these groups help make Martin Luther tick and are a great way to make new friends. 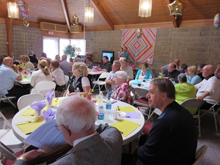 From “Elvis in the building” to Lunch Bunch & Friday Fish Fries, pot luck gatherings, WELCA dinners and an evening for Brother K for MD, along with weekly Sunday coffee and fellowship the gathering for food, fellowship, and fun has a rich heritage at MLC.